The JM Spider Custom Insulation System is a spray in application to ﬁll all gaps and voids that cause energy leaks. If you’re a builder, your homeowners will appreciate the savings from lowering heating and cooling costs. 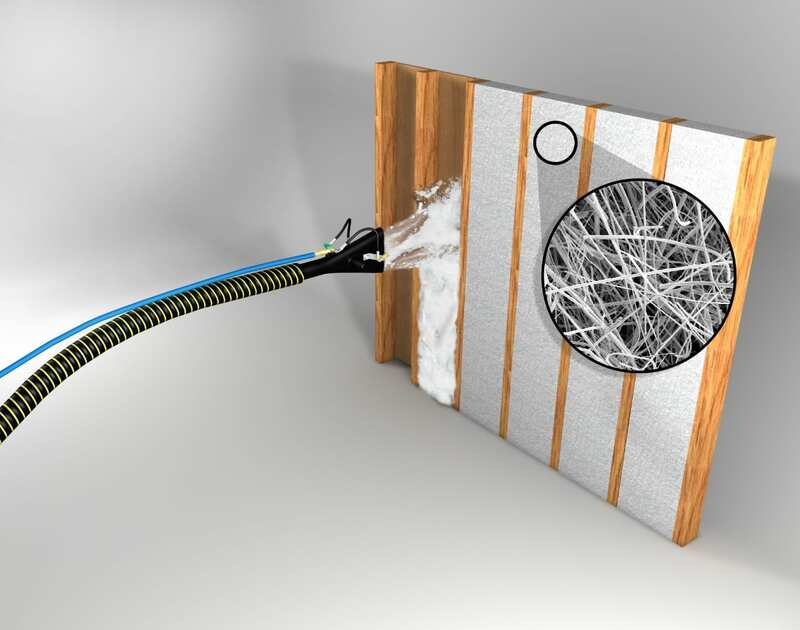 The JM Spider Insulation System has high thermal performance, achieving up to an R-15 in 2×4 wall cavities and an R-23 in 2×6 wall cavities. JM guarantees energy efficiency of the homes you build. JM will give homeowners a limited guarantee* that their heating and cooling energy usage will not exceed levels set by an independent expert. * Terms, conditions and limitations apply. Contact your Henges representative for details. JM Spider insulation sprays in to fill gaps and voids where noise can travel into the home. For example, JM Spider insulation achieves a Sound Transmission Class (STC) of 43 in an exterior 2×4 wood framed wall with 1/2″ particle board siding, 1/8″ pressed cardboard sheathing and 1/2″ gypsum board. Compare JM Spider insulation with other systems, and you’ll see that it is the best choice for reducing sound transmission. Homeowners will enjoy more peace and quiet in their new home. There has been a rising concern over some spray insulation systems that use water, which and can be a food source for mold. JM Spider insulation is made from fiberglass, an inorganic material that is naturally mold resistant. In addition, JM Spider insulation adhesive contains a U.S. EPA registered mold inhibitor, giving the insulation an additional layer of protection against the growth of mold, and thus improving the quality and durability of the homes you build. JM Spider insulation sprays on practically dry to the touch, using less than 8 oz of moisture per cavity in the adhesive while some other systems use more than 32 oz of water per cavity! In fact, JM Spider insulation can contain even less moisture than the surrounding wood framing. JM Spider insulation needs no drying time when installed with the recommended amount of moisture. You can be done with the job in just one day! You can put drywall up right away, while other upgrade spray systems may take 2-3 days to prep, install and dry. * Based on a 2700 SF home. St. Louis Home Builder and Henges Partner HBD demonstrates the value of JM Spider insulation.